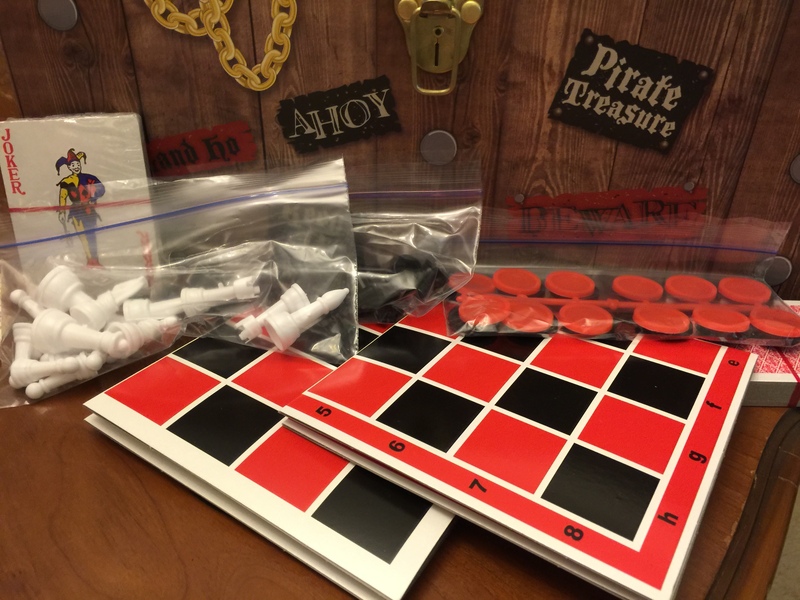 The whole kit is about giving options for different types of games and bits you need for those games, as well as creating inspiration for themes. 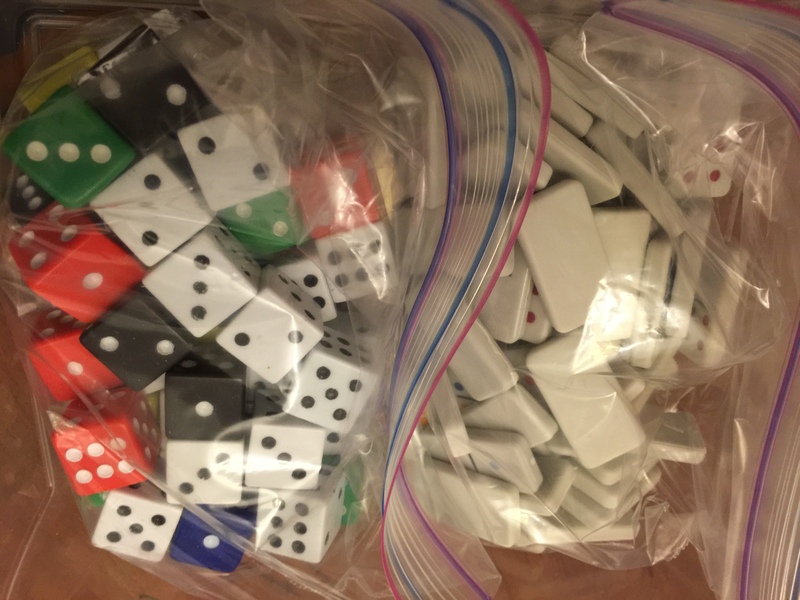 At our local dollar store, I found a pack of 5 white and 5 differently colored 6-sided dice. Considering the other pack just had 5 white dice, the 10 dice for a dollar was a steal. I grabbed a few of them so she’d have a bunch, and several of each of the non-white colors. I also grabbed a box of dominoes and a two-pack of standard playing cards. Most games require some sort of tokens that represent resources and currency, so, no brainer, I picked up some fake cash. However, I could have probably got better results by raiding an old Monopoly set. 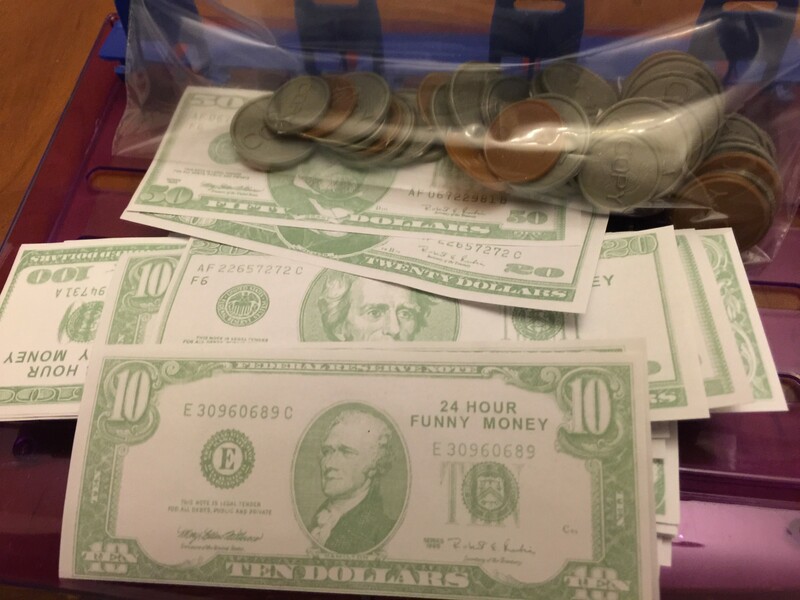 This was a case of “you get what you pay for.” The plastic coins had COPY stamped on them more prominently than the image, and the money was literally stapled together. The dollar store offered several options for “theme” options. 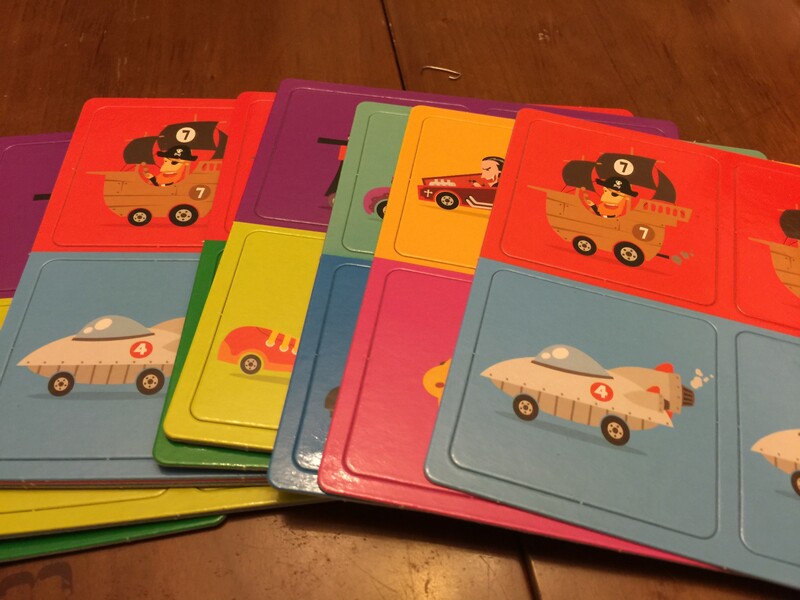 Pictured above, a memory game had cute little pictures that could easily inspire a “wacky races”-style game. There were several options for themed erasers that could easily stand in as player tokens, such as dinosaurs, astronauts, and Sesame Street. In the toy section, race cars could be used to give a physical representation of racers in a Mille Bornes-style game. Army men could be used for a strategy game. 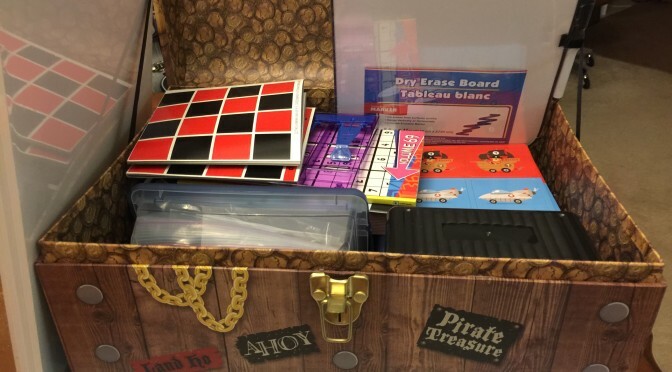 In the games and toys at the dollar store, really cheap chess and checkers games can be plundered for their parts or as a base to start a conversion. The store I was at also had flash cards, memory games, and puzzles that I opted not to get, but could be used for all sorts of things. 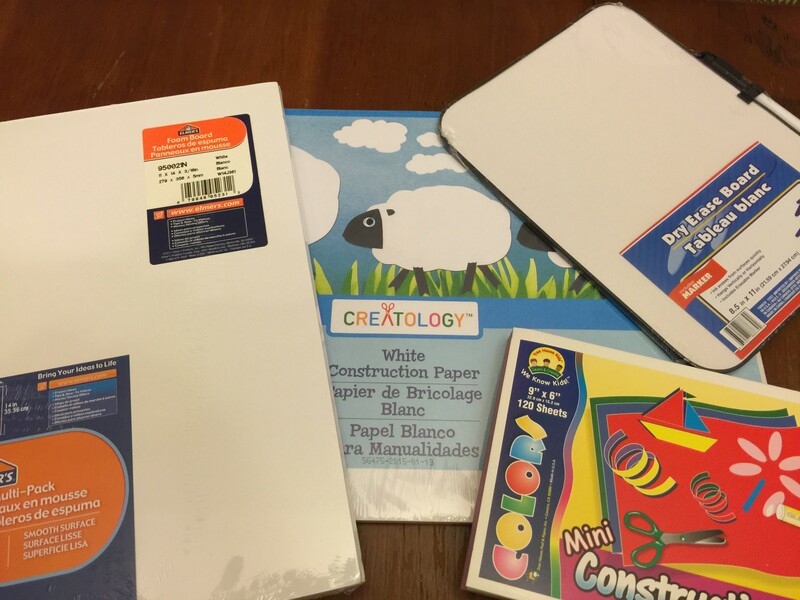 I got her white construction paper for prototyping of boards, some assorted colored construction paper to cut out shapes as needed, and some foam board for a “final” board prototype. For good measure, the dollar store had a little white board that could be a reusable planning surface or for scoring. 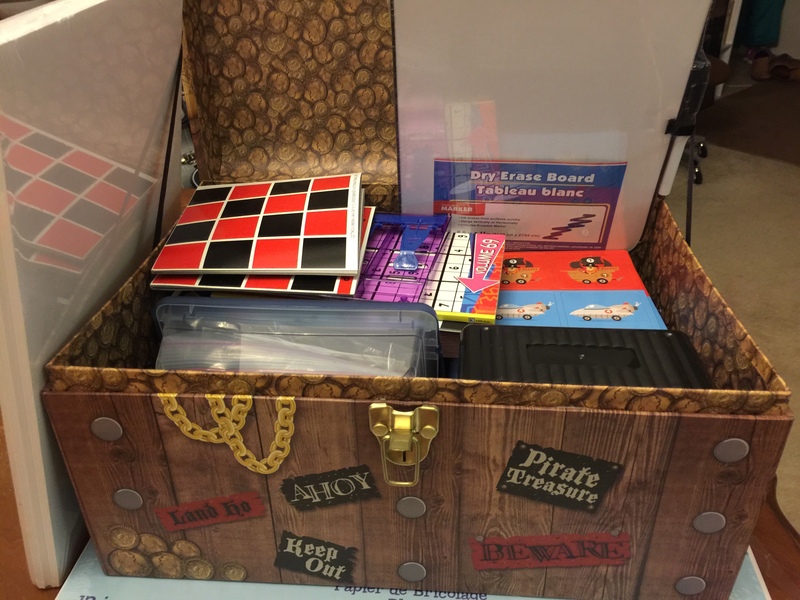 At a local craft store, I found a cute pirate-themed box and some storage boxes. I opened all the erasers and other boxes, sorting things into plastic bags, and putting like things in storage boxes. How many Monopoly sets do we need? Anything else? Any other suggestions?